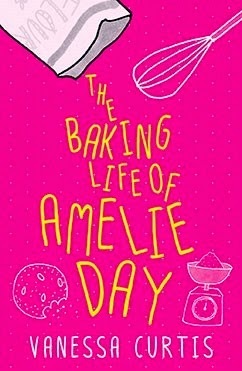 I found The Baking Life of Amelie Day by Vanessa Curtis to be an utterly charming middle grade book and I was in such a dilemma when reading it. On the one hand, I wanted to devour this book whole and not stop reading for anything. And on the other hand, I was quite desperate to stop reading and rush immediately to my kitchen and whip up a storm baking something, anything (though preferably using Amelie's own recipes that are included within the book!) The reading won out and all the way through I found this book to be so sweet and just that little bit heart-breaking. Amelie Day is no ordinary teen girl. She is a baking wiz and spends her entire waking life thinking up new recipes and combinations of flavours to make her baking creations the absolute best that she can make them. Her passion and enthusiasm for baking made me really smile and I love how generous she is with her baking. Giving someone homemade treats is the best and Amelie seems to know it. She really brightens up everyone around her with her baking. And she's good at it. She's made it into the finals of the Teen Baker of the Year award and is hard at work coming up with her three dishes to put forward. Unfortunately, her mother isn't keen to let Amelie travel to London for the award. Because the other thing about Amelie is that she has cystic fibrosis that means quite a few medical complications. I can't say that I knew very much about cystic fibrosis before I started reading this book but I liked that Vanessa Curtis wrote quite a bit about what it would be like for a teenage girl to have CF in a very honest but compassionate way. We see Amelie at her best and at her worst but at no point do we pity or feel sorry for Amelie because of it. Nor is having CF her most redeeming feature. This book is quite short but I feel like that it really packed in an emotional punch. I found myself really sympathising with Amelie's situation and could understand how she felt about wanting to take part in something so important to her as the Teen Baker award. But at the same time, I felt really bad for Amelie's mother for being protective of her daughter's health and taking a stand for what she believes will be really harmful. Also, total bonus points for including blogging into Amelie's narrative. I loved The Baking Life of Amelie Day. I thought it was sweet and fun and made my mouth water at the same time as shining a bit of light on cystic fibrosis in a way that I might not have otherwise come across.